‘The Problem of Thor Bridge’ gives us the classic impossible crime setup of a body that has been shot in the head but without any sign of a weapon to hand…and then manages to appear not at all impossible by finding the murder weapon hidden in the most likely suspect’s room, also throwing in a note from the suspected murderer arranging to meet the victim at the place of their demise and at around the time they are suspected of being having died. True, there are no footprints anywhere near the body, but – before you get too excited – “The ground was iron-hard, sir. There were no traces at all.” Oh, so that takes care of that, then. So why, then, have I included this in my sweep of Holmes’ impossible crimes when it’s so patently not an impossible crime? Well, unfortunately for me, I can’t really tell you that – or, rather, I don’t want to, because it will ruin the fun. Look, think of Dame Agatha’s And Then There Were None; none of those murders are technically impossible – someone is shot, someone is poisoned, someone is pushed off a cliff, etc – but it still technically qualifies as an impossible crime novel. 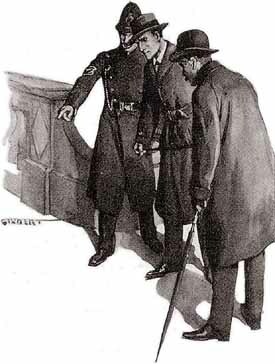 The same idea is in effect here: the murder itself isn’t impossible, but there is some aspect of it – the “one thing” that Holmes refers to above – which edges it into a sub-impossible crime, but you’re better off seeing it for yourself. It’s very clever – though how in the hell Holmes comes to the realisation he does is never going to be clear even on repeated readings. All of which makes a rather disappointing and somewhat trepid final foray into this examination of the canonical impossibilities. Hmmm, I should really have thought of that before I started. 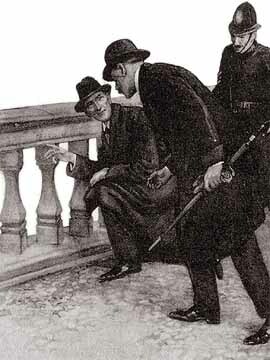 A few interesting points that I can discuss do occur, though, the first of which being the fact that no-one appears to have heard the murderous gunshot, though Conan Doyle doesn’t appear to bothered about that (don’t worry, it’s not a repeat of ‘The Adventure of the Empty House’). The second is the mention of the “travel-worn and battered tin dispatch box…crammed with papers, nearly all of which are records of cases the illustrate the curious problems that Mr. Sherlock Holmes had at times to examine.” Not only is this a dangling carrot now that Conan Doyle definitely has the end of his great detective in sight, but following hard upon this revelation is a mention of the case “of Mr. James Phillimore, who, stepping back into his own house to get his umbrella, was never more seen in this world.” – notable here for being an impossible disappearance tale written up as the marvellous story ‘The Adventure of the Highgate Miracle’ by John Dickson Carr and Adrian Conan Doyle for the collection The Exploits of Sherlock Holmes (which also contains the locked room murder ‘The Adventure of the Sealed Room’, itself drawn for a reference made by Conan Doyle in ‘The Adventure of the Engineer’s Thumb’…it all gets quite confusing quite quickly, doesn’t it?). What I would like to bring to your attention, though, what I found very interesting indeed, is the story behind this story. In the article Thor Bridge: A Mystery Remains (The Universal Sherlock Holmes, September 1991, pp. 16-20) Patrick J. Leonard relates the story of a real-life death that took place in exactly the same manner as the one described in this story. Originally relayed by Dr. Hanz Gross, Professor of Criminology at the University of Graz, it concerns a man identified only as A.M. who, after a night spent drinking, was found shot in the head on a bridge in a manner not unlike (that is, exactly the same as) our victim herein. The same key clue is in evidence as in this story and the same resolution is also reached (perhaps explaining why Holmes doesn’t insist on a particular course of action here, for fear of simply rehashing everything about this case). There’s not really any controversy in this, the use of real life crimes was hardly a new thing by the time this was published in 1922, but it is quite compelling to see such an unvarnished repetition of the circumstances (Christie at least has the decency to mix things up a little bit…most of the time). Frankly, it’s positively mild given the accusations that apparently surround The Hound of the Baskervilles and that Jose Ignacio brought to my attention via his review over at A Crime is Afoot. It’s been quite a week for learning things about Holmes and Conan Doyle! Also, one additional point of pedantry: following the death of Sidney Paget in 1908, it appears that a raft of different authors took up duties for illustrating the tales in the Strand, including younger Paget brother Walter; the sketches that adorn this post, however, are the work of Alfred Gilbert. All these beautiful illustrations have been taken from the superb online resource that is The Conan Doyle Encyclopedia – worth checking out if you’re a fan in any way (and, frankly, who isn’t?). Thanks for your kind mention. I like “The Problem of Thor Bridge,” but hate the type of solution it popularized, because it ruined many interesting and promising (impossible) detective stories by modeling the plot around such a solution – which are rarely satisfying. Interestingly, Melville Davisson Post published a locked room story in the same as year “Thor Bridge” and the explanations practically identical. But Post went all the way with the impossible-aspect offered by the situation. On the other hand, C.P. Snow used this explanation as a satisfying false solution a decade later in Death Under Sail. I’m not sure which real-life case was referred to in that article, but I detailed such a real-life locked room case from the 1830s in a post on my blog, which was solved by a policeman interpreting a type of clue you’re only suppose to encounter in fiction. It seems to have been the origin for this gambit: in both real-life and crime-fiction. It weasn’t that example, no, it was one that was exactly Thor Bridge – on a bridge and everything – just without Holmes (the exact same clue that gave away the workings and everything). Thanks for the link, too, I’d forgotten how good Captain Disillusion is! The Puzzle Doctor once expressed his annoyance that a particular novel by Ellery Queen is often referred as a locked room mystery, whereas it is locked room/impossible crime for only one person and thus this is a spoiler. Similarly the story of Thor Bridge is an impossible crime for only one person and that person turns out to be the killer !